Thanks to all of our volunteers for your help and support! DMR protects public health by monitoring coastal water quality and toxic phytoplankton in all shellfish harvesting areas. Water quality data are needed to regulate shellfish growing areas to ensure that only pollution-free areas are open to harvesting. Water samples are collected monthly from January through December. Phytoplankton volunteers collect water samples in the spring, summer, and fall using field microscopes to identify toxic phytoplankton species. Volunteers work independently after receiving training and equipment needed to collect samples. 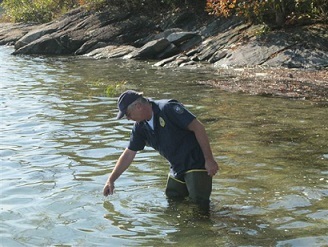 Water quality volunteers assist by collecting water samples for analysis at our labs in Lamoine and Boothbay Harbor. Because the DMR currently has sufficient numbers of trained water quality volunteers, we are accepting new volunteers only for special projects that may develop in coastal communities. For more information, please contact Sheena Glover. These volunteers assist the DMR biotoxin monitoring program, which closes shellfish flats to harvesting when toxin(s) are found present in a species and are found at potentially harmful levels. Volunteers receive training, on-going support, and the necessary equipment to carry out the duties of this program. We currently have sufficient numbers of phytoplankton volunteers to cover monitoring efforts along the coast.